Display the same or different output on up to four displays. 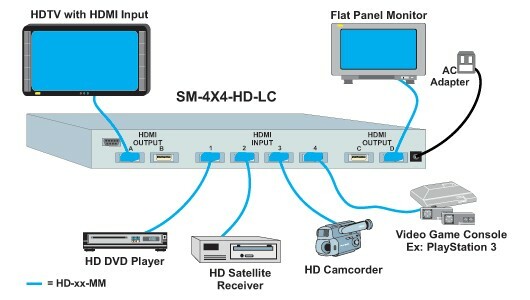 Eliminates the need to disconnect and then reconnect numerous HDMI sources. Ideal solution for connecting numerous HD media devices such as video game consoles, media PCs, set top boxes, DVRs, DVD players etc. Supports 480i, 480p, 576i, 576p, 720p, 1080i, and 1080p resolution for HDTV displays. Supports up to 1920x1080 resolution for monitors. Front panel buttons with LED indication of port selection. Bi-directional IR remote control for easy port selection. Via female DB9 RS232 serial port using HyperTerminal. Requires straight-through wired RS-232 cable. AC power adapter with 4 international plug adapters.